Here are some simple troubleshooting procedures for your Moto Mirror. IMPORTANT: Before performing any other troubleshooting work, check to see that the unpinned nuts locking the mirror to the mirror bracket are tightened to 15 foot pounds of torque, plus or minus 2 pounds. Mirrors that are loose in the bracket are the most common cause of reported Moto Mirror failures. Most reported problems with Moto Mirror and Road Scan remote control mirrors can be resolved with simple troubleshooting procedures while the mirror is still on the truck. 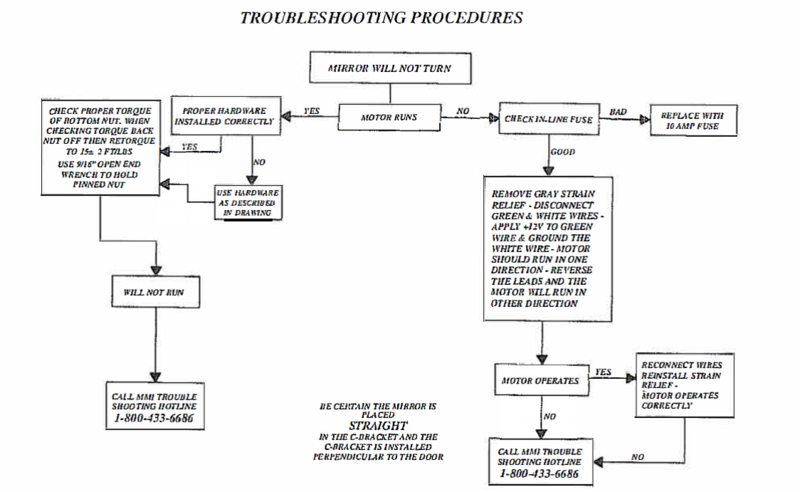 Listed below are the basic troubleshooting procedures that should be followed if your Moto Mirror or Road Scan product fails to operate properly. Following these simple procedures will save time, unnecessary removal of a mirror from the truck or a rejected warranty claim on a mirror that is operating properly. If the mirror's motor can be heard operating inside the mirror case, but the mirror will not rotate, perform the transmission troubleshooting procedures in the order listed below. Listen for the sound of the motor turning when the mirror switch is activated. If the motor does not work, refer to the ''TO FIND A MOTOR PROBLEM" section of your Moto Mirror Manual. Is the mirror's transmission shaft tightly locked to the truck's mirror bracket? The majority of reported mirror problems are the result of loose mirror locking nuts. The unpinned lock nuts securing the top and bottom of the mirror to the brackets are tightened to 15 foot pounds of torque, plus or minus 2 foot pounds. Refer to drawings of the proper lock nut installation on pages 6 and 7 of this Manual. If a convex mirror must be mounted to the Moto Mirror's transmission shaft, ii must be installed on the shaft below the bottom tightening nut. If the convex bracket is mounted next to the truck bracket's mirror shaft attachment point, and the convex bracket is mounted next to the truck bracket's mirror shaft attachment point, and tightened with the same nut that tightens the Moto Mirror, rotation of the Moto Mirror will cause the nuts to loosen and stop mirror rotation. Bracket is mounted next to the truck bracket's mirror shaft attachment point, and tightened with the same nut that tightens the Moto Mirror, rotation of the Moto Mirror will cause the nuts to loosen and stop mirror rotation. If the mirror's motor is working and the mirror is tight in the truck's mirror bracket make certain that the transmission shaft is turning. Is the transmission shaft turning? Remove all mounting hardware from the bottom shaft and mark a spot on the thread of the bottom shaft (transmission) of the mirror. Activate the mirror motor switch to see if the bottom shaft moves. The shaft will turn very slowly at about 1/2 RPM. If the transmission shaft turns, properly reattach the mirror in the bracket and test for blockage of the mirror's rotation pathway. Make certain that nothing is blocking the Moto Mirror's rotation pathway. Check to see that the truck's convex mirror does not block the mirror's rotation path. If it does, readjust the convex mounting point or eye position to reduce Moto Mirror blockage. Is all Moto Mirror hardware correctly installed? On certain older model Moto Mirror units pinned upper transmission lock nuts were not used. If the upper transmission lock nut (closest to the base of the transmission) is not pinned, make certain that it has not been jammed up against the base of the transmission case. This condition will cause the transmission to bind, run slowly and, eventually, wear out. Is the top plate of the Moto Mirror pulled up out of flatness because of being tightened in an improperly spaced bracket? This condition will cause the mirror to operate erratically and may contribute to vibration when the truck idles. Is the mirror mounted straight up and down in the bracket? If the mirror is not straight up and down in the bracket the top or bottom shafts of the mirror may be bent, causing erratic movement and eventual failure.